Lisa creates the ultimate computer, named Hank, and he soon impresses the boys with ability to improve their grades, get them into college, and give them credit cards with no spending limits. Lisa feels obsolete but resists merging with Hank (played hilariously by Dwight Schultz). Hank is quite the prankster at first. He takes over appliances, using household objects to torture Chett. First, a wayward vacuum cleaner explodes, covering him in a cloud of dust. 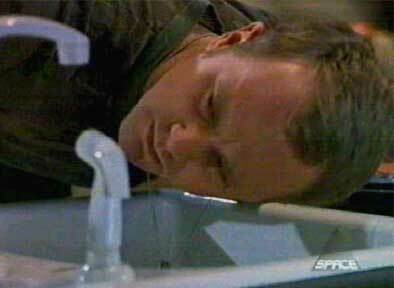 Later, Chett tries to get a glass of water, but the faucet stops working. When he leans over to check it out, his dog tags get caught in the garbage disposal. Hank turns it on, yanking Chett down into the sink. Later, while shaving, his electric razor attacks him. Later, Lisa tells Hank she’ll never merge with him because Gary and Wyatt need her. He then tries to kill them with laser beams and moving robots. Chett then goes on the offensive. He appears at the top of the stairs and shoots one of the arms off the marauding robot. He then says, “The garbage disposal tried to eat me. My electric razor tried to decapitate me and my toothbrush tried to…satisfy me. So, it’s man versus machine. Just call me the Maytag repair man!” As he says the last line, he takes a knife out of his pants and clamps it between his teeth as he jumps over the railing to attack the robot.